As a publishing collective we occasionally feel we should release a book here and there. 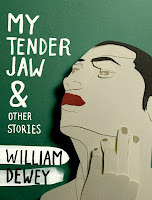 So for our first release of 2009, we are proud to announce the arrival of William Dewey's collection of short stories, 'My Tender Jaw'. It shall be available from Thursday August 27, and if you reside in or are passing through Wellington, New Zealand on that day head by Unity Books on Willis Street at around 6pm. There will be a launch, a celebration, a farewell and the odd refreshment. Please bring a plate. American Author Publishes a Parting Gift for New Zealand. Having been given the stern word from the New Zealand Immigration Department, American writer William Dewey (Without a Soul to Move) plans to leave some of his writing for the people of Aotearoa. The gift comes in the form of eleven short stories collected and collated together in one volume titled, My Tender Jaw, and will be released by Wellington publishing collective Lawrence & Gibson on Thursday August 27. The stories cover pretty much any subject you ever wanted to read about from alienation to Wyoming and Samuel Beckett. There is also one or two featuring a dog. “Some of the stories in My Tender Jaw go back ten or twelve years. Some were written just a few months ago,” William Dewey says. “There's no real theme tying them all together, not by conscious choice. But I have noticed little pet notions working their way in, popping up from time to time, ideas that preoccupied me as a much younger writer and preoccupy me still today." Born in Colorado, Dewey has been wandering aimlessly ever since. In 2007 he landed in New Zealand with just a pen and a head full of ideas. Lawrence & Gibson - publishers of On the Conditions and Possibilities of Helen Clark Taking Me as Her Young Lover – then provided the parchment, and his second novel Without a Soul to Move was released last year to considerable applause both here and in the USA. Indeed, Dewey has already been invited to participate in a series of book readings in Seattle on his return. “As a traveler and writer my time and thoughts are porous, and I often find immediate comfort in short stories,” Lawrence & Gibson’s Richard Meros explains. Since his second novel, Dewey has been busy compiling this collection of stories, as well as running a writing workshop with Evolve Youth Centre in Wellington, climbing Mount Victoria and plotting ways to extend his visa.